Every day more than a million new Android devices are activated worldwide. Android’s openness has made it a favorite for consumers and developers alike, driving strong growth in app consumption. Android users download billions of apps and games from Google Play each month. Android is continuously pushing the boundaries of hardware and software forward, to bring new capabilities to users and developers. For developers, the rapid evolution of Android technology lets you stay in front with powerful, differentiated applications. Android gives you access to the latest technologies and innovations across a multitude of device form-factors, chipset architectures, and price points. From multicore processing and high-performance graphics to state-of-the-art sensors, vibrant touchscreens, and emerging mobile technologies. For example, you can create a single app binary that’s optimized for both phone and tablet form factors. You declare your UI in lightweight sets of XML resources, one set for parts of the UI that are common to all form factors and other sets for optimzations specific to phones or tablets. At runtime, Android applies the correct resource sets based on its screen size, density, locale, and so on. Billion downloads a month and growing. Get your apps in front of millions of users at Google’s scale. 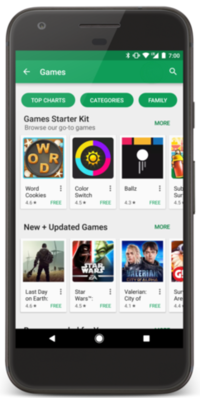 Preinstalled on billions of Android devices around the world, Google Play can be a growth engine for your business.